The heavily cratered portion of the surface of Jupiter's moon Callisto, seen in this image recorded by NASA's Galileo spacecraft, resembles most of Callisto that's been seen in high resolution. This adds evidence to a theory that Callisto may hold an underground ocean. The area in the image is the opposite point, or antipode, of Callisto's Valhalla impact basin. The antipode of any point on a sphere is the opposite point on a line through the center of the sphere. Antipodes of major impact sites on some other worlds similar in size to Callisto, such as Mercury and Earth's moon, show a grooved and hilly terrain attributed to seismic shocks focusing on those points from the distant impacts. The antipode of Mercury's Caloris impact site is one example. When Galileo flew near Callisto on May 25, 2001, scientists sought an image to check the Valhalla antipode for similar signs of disruption. Computer modeling has suggested that if Callisto had a water layer in its interior, that layer would have dispersed the seismic shock waves from the ancient Valhalla impact. The absence of grooved and hilly terrain at the Valhalla antipode is consistent with that possibility. Magnetic-field measurements have previously suggested that Callisto has a layer of liquid water deep below its surface. 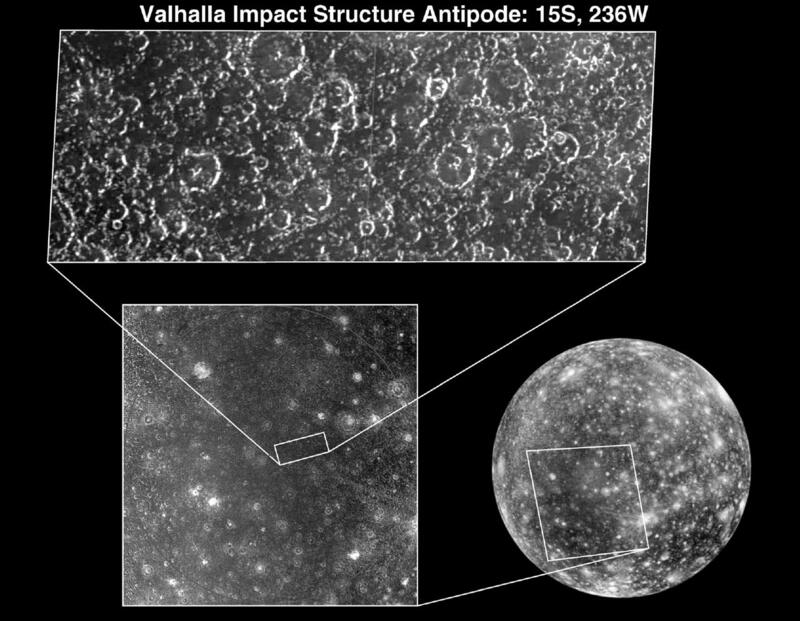 This image, taken from a distance of 32,000 kilometers (about 20,000 miles) shows details at the Valhalla antipode down to a size of about 330 meters (about 1,250 feet) across. Callisto is the outermost of Jupiter's four large moons. Its surface of ice and rock is the most heavily cratered of any moon in the solar system. For a view of this image in context click here.